It all started with a book I was reading, “Heat”, by Bill Buford. He was talking about making fresh pasta and how the best pasta requires really good eggs from nearly wild, local chickens. Eggs whose yolks are a particular brand of orange, not pale yellow, and whose whites stand up tall when you break them into a pan. My quest had begun; I became obsessed. Where to find the eggs of my dreams? Thus, my research began. It seems that “industrial farming” has taken over our food supply and in order to get more eggs in less time, the “folks in charge” have developed breeds of “super chickens” that mature faster and produce more eggs than any chickens in history. And, because of the unhealthy conditions in which they are raised, the birds are susceptible to disease so they are given powerful antibiotics and growth hormones. They are fed animal parts (including chicken) as well as GMO corn. This was enough for me to swear off supermarket chicken and eggs for the rest of my life. (For all the facts, go to www.sustainabletable.org and be sure to check out the award-winning film “The Meatrix” while you are there). As a result of my research, instead of shopping at the grocery store, I bought eggs from every vendor at the farmer’s market and though they were good, they just weren’t the eggs I was looking for. I was looking for eggs with deep golden (almost red-orange) yolks, small eggs that were so fresh you could barely break the shell, eggs that would make the perfect homemade pasta I was striving for. 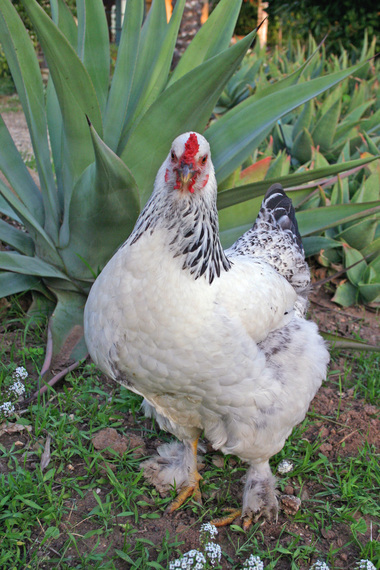 The foremost local authority on raising poultry is Katherine Anderson of Blue Oak Ranch in Goleta and she became my source of all things chicken. She told me about “Heritage Breeds” and how the safety of our country’s food sources rest in the hands of small farms and the “backyard” farmer. Why? Heritage Breeds are old breeds of animals that are the animal equivalent to Heirloom seeds. They are bred naturally; they still have natural instincts, like foraging, nesting and they lay a superior egg (in the case of chickens). And, as a bonus, they are beautiful and their eggs come in every size, shape and color. I asked Katherine to pick out a nice assortment of heritage breed hens for me. Meanwhile, I needed a coop. I found the perfect man for the job in Loren, a permaculture designer and chicken coop builder. Using all the construction “left-overs” at our house, he constructed a coop, nesting boxes and run for my future brood. Eventually, my chicks arrived and after about a month of living in a large cardboard box, they moved into their new home. I had heard about “watching the chicken channel” in fact I had read somewhere that one of the advantages to raising your own hens was “hours of entertainment”, but me, I didn’t believe it. Though, in a few short weeks, we were spending any of our spare time “hanging with the chicks”. I can’t explain it. This was entertainment! After a while certain ones were obvious favorites, Coco (of Coco and Channel, the two French Marans) would jump on my knee or my shoulder, Jayne and Marilyn (the Gold Sexlink duo), Georgia and Teddy (the pair of Speckled Sussex) Polka and Dotty (Silver laced Wyandotte) to name a few and the crazy thing is they had distinctly different personalities! Was there something wrong with me? Even if I had a rough day, going to see the chickens was sure to bring a smile to my face. Had I gone mad? Apparently not, according to what happened next. I began to discover that there were others, just like me right here in Montecito. It seemed like everyone we met either had a few hens or knew someone who did. The excitement grew! People wanted to show us their hens and their coops. There are chicken lovers out there that I had never noticed before. One of the most amazing stories was of the woman up on Coyote Road who lost her home in the Tea Fire, but somehow (and miraculously) the fire fighters had saved her chickens by covering the coop in fire foam. Her chickens survived the tea fire, unscathed. But, I have meandered off the path, or have I? In fact, what began as a quest for the best eggs and thus the best fresh pasta on earth, ended in a kooky form of entertainment, loads of fun, companionship, preservation of the gene pool for future generations and yes, the best eggs on earth and some really great pasta. That's it, measure the flour onto a board, make a well in the center, crack the egg. Beat the egg with a fork and gradually mix with the flour. knead until smooth then wrap in plastic wrap and let rest for at least one hour. Then roll by hand or with a pasta machine. Thank you theatregeek1008, I appreciate your comments, really I do.. Thank you very much for all your kind words, seedling. Maybe you'll get your own little house someday and can have your own urban farm! Good luck to you! What a great story. I sure wish we lived in a community where we were allowed to have chickens...goodness knows that the neighbors multiple dogs should qualify us. I am thankful for the education and resources in your post and delighted that it was the making of homemade pasta that initiated your search. I also like to make homemade pasta; it tastes so much better than store-bought. Now, it looks like I&#x27;ll have to start taking a closer look at our eggs and chicken (if not all of our meat purchases) and decide how to proceed. Oops, I deleted my original comment and your response! Didn&#x27;t meant to do that! 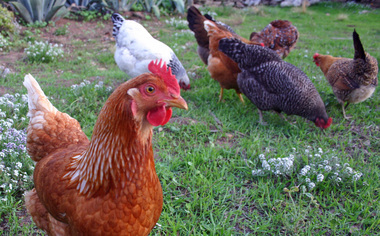 Yes, we can have a coop - up to 10 hens and no roosters. I have several friends here in Austin that have chickens and they love it. I agree with the chief cultivator with the concern of adding a little bit too much to my life at the moment. I do hope that chickens will be in our future at some point! I loved Animal Vegetable Miracle - what a great book - read parts of the chapter about the turkeys to my 10 year old. I am currently reading Recipe for America - all about sustainable agriculture and how we as ordinary folk can make a difference. Hi Garden Girl, Our son and his family live in Austin! We visited them last year. What a great place to have chickens and a garden. It seems like a real sustainable type town. I checked out some of the local farms when we were there. Thanks for reading my post. Austin is a pretty neat place to live. The local farms are great (my kids love Boggy Creek Farms.) I am joining a CSA with Johnson's Backyard Garden this year and looking forward to touring it! My little garden just didn't give me enough last year - the veggies and the people all wilted in the heat! Maybe this year will be better! I had no idea there were Heirloom Animals!! How cool... I&#x27;ve been thinking about a chicken coop, and had recently decided life was crazy enough this year to add more chaos to our lives (just got a new puppy, have 5 kids, with twin 2 year olds...!). But, this totally inspired me to think about it again. I love the idea of an urban farm and having my kids learn about growing your own food... not just good for the planet, but good from a family / community experience, and of course, better tasting food! Hello Chief cultivator, regarding heirloom animals, go to www.albc-usa.org American Breeds Conservancy, fun to see all the breeds that small farmers and backyard farmers are keeping alive. We are the future of the gene pool. I read your profile and boy I need to meet you. I just joined facebook and bloging a couple of days ago and have so much to learn and you are an expert!! Wow, that is great. And you are in WA, what a great area of the country. Thanks for reading my post. keep in touch. 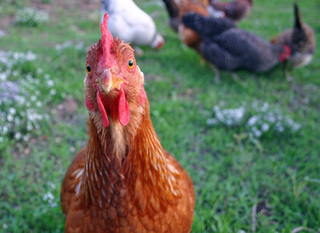 what an amazing post, as well as beautiful shots of your glamor chickens! I swear the chicken in the last picture is saying &quot;I&#x27;m ready for my close up!&quot;. Such great info about heritage chickens- never knew that, but am learning a lot about big farms. Just watched Food Inc too - YUCK. Never have I been so turned off in my life! My husband just met Michael Pollan who wrote &#x27;The Omnivore&#x27;s Dilemma&#x27; and so we&#x27;re feeling a like maybe we should have a little coop of our own! <br/> <br/>Thank you!! How did your hubby meet Michael Pollan? The whole fam listened to In Defense of Food on a car trip and three of just watched Food Inc. It hard to act on all of it at once. We've been eating produce seasonally for awhile and purchase seafood thoughtfully. I am re committing to staying away from the conventionally grown 'dirty dozen' and trying to shop more at the farmers markets in the area. Can't quite bring myself to pay $5/dozen eggs all the time. :( And thinking about putting in a coop reminds me of the book The $64 Tomato (hilarious read) and predicting I would then be eating a $64 egg (which makes the $5/dozen not so bad!) But I assume that most of us find we don't garden or raise chickens to reduce the grocery bill but to increase the quality of our lives and food. My husband is getting his MBA in sustainable business -- he's a green builder. Michael pollan came to his school to give a talk and he said it was just amazing. I LOVE the $64 tomato. It is so true, but I guess we all have to do our small part to try! And you know what, after last summer's tomatoes, I would pay $64 for them! They were awesome. I love love love Barabara Kingsolver- I have to read that book. So lucky to be in Santa Barbara-- lived in LA for 12 years :) Now in Seattle. Went from one extreme to the other. Hi again, Fig tree, that is a great story of how your husband met Michael Pollen. What a great idea to become a sustainable builder and getting an MBA, I didn't even know such a thing existed. he may be interested in something I am getting involved in which is a green building networking site kind of like this one. it is brand new Greenbuildingpro.com, I am going to be a contributing writer on the landscaping side of things. You do love Seattle more that LA don't you? I love Seattle..haven't been there in ages. Barbara Kingsolver's book is great, loved it..
thanks for the site- i told him about it and he's going to check it out. he really likes his program and he's been a builder for a while, so it all seemed to just go together. seattle is great, but miss LA a bit. good friends there- and I miss the weird people and all of my amazing succulents! !